The sizzling, un-put-downable sequel to the New York Times bestselling Rebel of the Sands, by Goodreads Choice Awards Best Debut Author of 2016 Alwyn Hamilton! Mere months ago, gunslinger Amani al'Hiza fled her dead-end hometown on the back of a mythical horse with the mysterious foreigner Jin, seeking only her own freedom. Now she's fighting to liberate the entire desert nation of Miraji from a bloodthirsty sultan who slew his own father to capture the throne. When Amani finds herself thrust into the epicenter of the regime--the Sultan's palace--she's determined to bring the tyrant down. Desperate to uncover the Sultan's secrets by spying on his court, she tries to forget that Jin disappeared just as she was getting closest to him, and that she's a prisoner of the enemy. 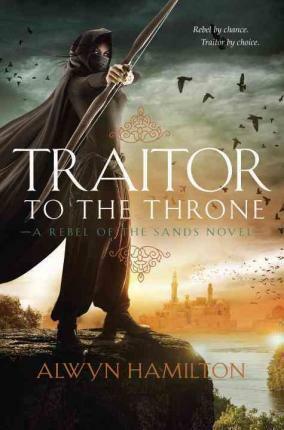 But the longer she remains, the more she questions whether the Sultan is really the villain she's been told he is, and who's the real traitor to her sun-bleached, magic-filled homeland. Forget everything you thought you knew about Miraji, about the rebellion, about djinni and Jin and the Blue-Eyed Bandit. In Traitor to the Throne, the only certainty is that everything will change. Rebel of the Sands was a New York Times bestseller, published in fifteen countries and the recipient of four starred reviews and multiple accolades, with film rights optioned by Willow Smith. And its sequel is even better. Alwyn Hamilton was born in Toronto and spent her childhood bouncing between Europe and Canada until her parents settled in France. She grew up in a small town there, which might have compelled her to burst randomly into the opening song from Beauty and the Beast were it not for her total tone-deafness. She instead attempted to read and write her way to new places and developed a weakness for fantasy and cross-dressing heroines. She left France for Cambridge University to study History of Art at King's College, and then to London where she became indentured to an auction house. She has a bad habit of acquiring more hardcovers than is smart for someone who moves house quite so often. Follow her at @AlwynFJH.